Understanding and using the right tools and materials to create a work of art can make a monumental difference in appearance, texture, permanence and more. No matter what medium an artist may use, there are many choices to make and things to consider when beginning a new art piece such as what type of surface or support to paint on, what kind of brush to use and how a medium will ultimately look on a chosen surface. This book covers pencils, brushes, surfaces, supports, mediums, varnishes and more. It provides fine artists with a quick reference for not only understanding how to use an array of fine art tools, but also how the tools work best. The book is divided into two sections. The first section is focused on various tools and materials, and the second section is broken up by medium. This comprehensive resource book is color-coded so information can be located quickly and easily. 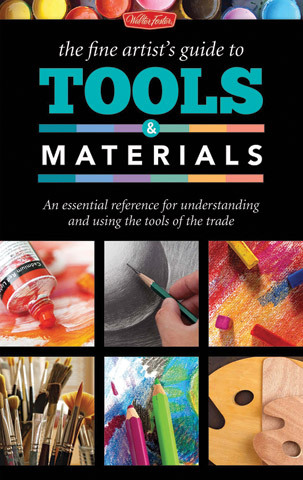 In this first section, artists will find basic information on available tools and materials, including a brief description of each item, what each item is used for and safety tips for working with specific materials. The second section covers how to work with tools and materials specific to each medium including pencil drawing, acrylic, oil, pastel and watercolor. The book includes visual examples, comparisons and color photos to help artists determine which paints, surfaces, implements and other materials best fit the style and vision for their art.